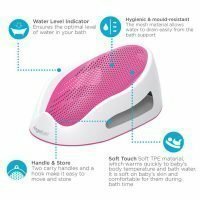 The Angelcare Soft-Touch Bath Support takes the worry out of bath time and provides optimal comfort and safety for your baby whilst bathing. Designed for comfort the bath support is mildew free and hygienic. Its unique design combines safe sturdy sides and an angled area made from special soft material for your baby. The soft TPE material not only comfortably cradles your baby but it also reaches the bath water’s temperature very quickly making baby feel warm and safe. The Angelcare Soft-Touch Bath Support also has a water level indicator for optimal safety in the bath. 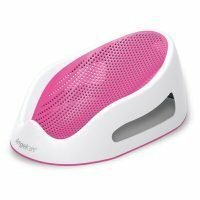 The Angelcare bath seat support is recommended for babies up to 6 months of age. Maximum recommended weight capacity is 14kilos (30lbs). No assembly is required.